Do you think this will put me on the Homeland Defense watch list? At the same time, I found another book by the same author, The Art of the Catapult, which contains the plans and history of everything from your basic ballistae, right up through a very Frenchified trebuchet. 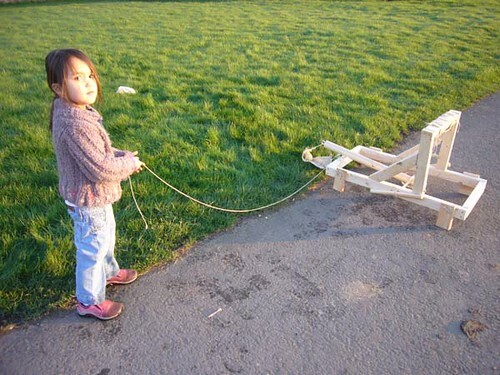 This Sunday was a beautiful, chill morning, and I went down to my local hardware store, and bought all the necessary ingredients to make my very own onager. Just like Julius Caesar would have had. 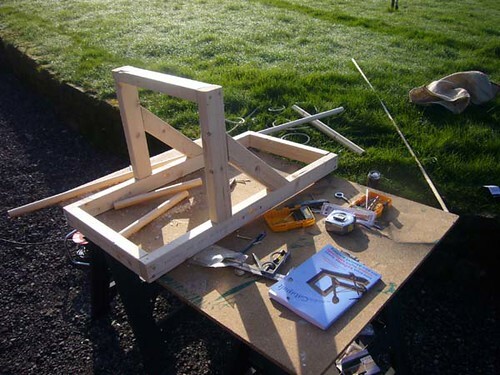 The difference between a catapult and an onager is the spoon on then end is replaced with a kind of sling mechanism. Either you can have a sacrificial sling (tied to the ammunition so that it launches along with your big rock), or one that opens up at the apex and hurls your ammunition with greater force. We chose to launch potatoes. I really wasn't sure how far this thing was going to go. "Onager" translates from the Latin for "Mule". As in "Kicks-like-a-". So I had the whole thing rigged to be triggered from several feet away. The force is provided by a 'torsion engine' - a rope which is looped around the throwing arm and then twisted extremely tightly around and around to provide the potential energy, to that cocking and loading the mechanism (the Critter insisted that she be the one to load the potato) was a bit of an adventure. See? This whole thing really is a science lesson for the kid. The first time we fired the thing, the potato flew (and I measured) not quite 3 feet. Julius Caesar would not be impressed. A few more tests, and twisting the torsion engine tighter and tighter each time, we got the potato-hurling to reach new heights at about 9 yards. If we include the distance it rolled after striking the ground. OK, so we weren't ready to go a-sieging, but we were making progress. One twist too many, and the frame splintered. 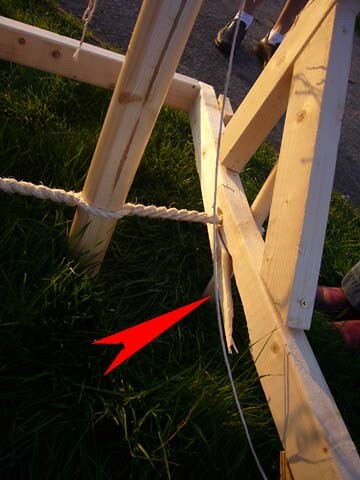 When I scaled up the design, I guess I didn't take into account the additional bracing needed, and our catapulting was over for the day just as the sun started to set. During the afternoon's construction, several of my neighbors wandered by and invariably asked what we were up to, to which I just pointed to or held up the book. My male neighbors were all keenly interested immediately, and we would exchange grunts of mutual admiration for twenty minutes while chugging beers and setting fire to large hunks of meat or other appropriately masculine signs of respect. 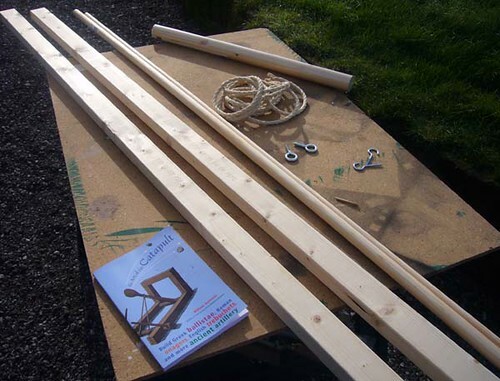 My female neighbors all asked the same question, "Why do you want to build a catapult?" So I can hurl things, silly woman. I bet Caesar never got asked that question. The Critter never questioned the need to hurl things, fortunately. I can only conclude that there is something in the female development cycle which kicks in sometime between adolescence and getting married, and that I have a few more years of semi-destructive science projects to do with her yet. 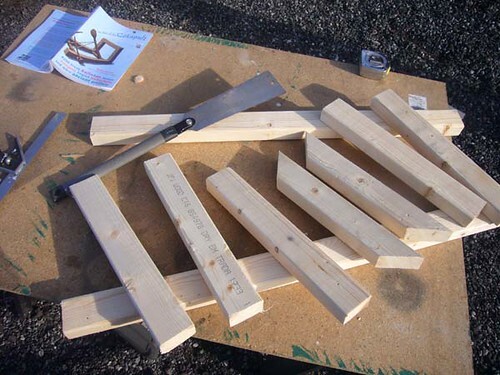 I've bought more wood at the hardware store today. 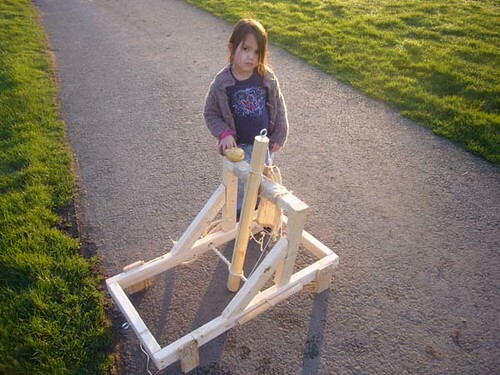 The next catapult will be stronger and bigger.